These are very pianistic works, played with brilliant pianism. Two things particularly distinguish the collection: (1) most of them were recently commissioned by the pianist with performer input; and (2) their sections are brief--these seven works by six composers consist of thirty-three movements, varied in rhythm, tempo and dynamics. The half-hour title work of the collection is also unusual, even unique, in that, comparable to Mussorgsky's Pictures at an Exhibition (also written originally for the piano), its twelve movements are inspired by pictures. The artist is McLeod's friend and fellow-composer, Haflidi Hallgrimsson. 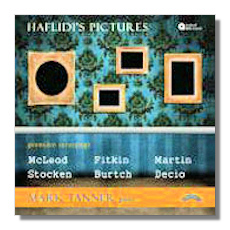 Twelve of his sketches, selected from fifty, are reproduced in the booklet, following Mark Tanner's notes. In addition, inspired by the music rather than directly by the pictures, the movements are introduced by short poetic "aphorisms" spoken by the composer. McLeod's aphorisms (Commissioned 2007/8) are whimsical, even bizarre, and always entertaining. I am not prepared to judge their aptness or say much about even the connections between the pictures, aphorisms and music but no doubt this could be a continuing source of reflection by interested individuals. But the clearest reference to Mussorgsky comes in "Witch on a Pedestal," when he is not only mentioned but a theme from his Pictures is quoted. "Devil in a Cupboard" is peremptory, fast and sometimes tinkly. "Tortured by Noise" is of course not quiet or gentle but is not nearly as cacophonous as it perhaps might be. "Devil in a Cupboard" is peremptory and fast. Several aphorisms are quiet, though "Silence" is sounded and does not endure for Cage's stipulated 4"33" that is mentioned. "Winter Landscape" is calm and quiet, with lovely, bell-like notes. "Italian Huntsman" is also quiet with some rapid arpeggios. "Holy Man with Cross" is both quiet and stately. "To the Heart of the Matter" proposes simplicity and quiet communion of lovers. "Music on the Move" strives for extreme tempos. Other aphorisms include "A Fish Can Sing," "Snakes in a Garden" and "Fragments from a Picture." McLeod is very much inclined to write music that is virtuosic and achieves this. Tanner has no difficulty meeting any of his demands. The opening piece on this recording, Burch's "Five Aphorisms" (1989), which take less than five minutes, might better have been placed later on the disc. I at least found the opening aphorism very off-putting, even though it lasts only 33 seconds. At the risk of finding myself in some future "Lexicon of Musical Invective, it suggested to me nothing so much as a rude person coming into a formal reception to make some spontaneous, jarring and raucous improvisation for his own amusement. Very staccato. The following four aphorisms were in quite a different mode: slow and limpid; Prokofievan; very fast and lively; jazzy. Decio's Musical Box Suite (commissioned 2007), in four movements, is mostly quiet and peaceful. Its third movement has vigor but even that is rather formal and conservative. The first two movements struck me as plangent. Fitkin's "Furniture" (1989) is jazzy: very staccato and percussive. Tanner calls it "manic, jazz-rock inspired," and says it takes its energy from "brazen cluster chords and daring leaps to the extreme registers of the keyboard" and "has a deliciously random ring too it that, thankfully, is not clarified on repeated listening." Martin's "Prism" (commissioned 2007/8), with seven varied movements in twelve minutes, including some slow and pensive "Blues"; two fast dances; "Aria," quiet and indeed songlike; a reflective "Pastorale"; a quiet "Intermezzo", which happens to be placed first; and "On a Whim" which earns its name. Martin's "Dunes - Hills of Wind-Blown Sand" (commissioned 2007), sounds the way its movements – "Hush," "Wilds" and "Suspension" – promise. Wilds is lively and Suspension is simple, slow, with some rests and arpeggios, and quiet to the end. Stockton's brief "Bagatelle" (Commissioned 2008) is marked by clarity of sound. The concluding conversation between McLeod and Tanner is interesting and informative.